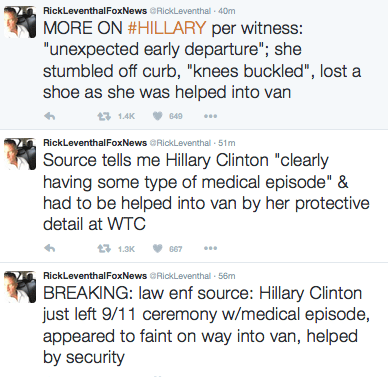 ANOTHER UPDATE: Hillary Clinton reportedly has ‘medical episode’ at 9/11 ceremony. The 68-year-old Democratic nominee appeared to faint shortly before 10 a.m. as family members of the 2,977 victims were reading through their names, and minutes before a moment of silence at 9:58 a.m. commemorating the collapse of the South Tower, sources told The Post. A witness said the former Secretary of State’s knees buckled and she lost a shoe as her security team rushed her to a nearby van. Clinton left the event so abruptly that she even left behind the pool of reporters assigned to follow her. But remember, the people who have been raising questions about her health are racist, sexist conspiracy theorists. MORE: Now they’re saying she was “overheated.” At 9 am in September in New York, with a temperature in the 70s? Meanwhile, CNN is looking kind of sickly, too. Flashback: HuffPost Fires Contributor, Deletes Articles Questioning Hillary’s Health. STILL MORE: Video of Hillary being carried, falling. But yeah, if you’re raising concerns about her health, it’s because you’re a racist, misogynistic conspiracy theorist.